There are over 1,000 varieties of bananas on the planet, so it’s a bit ethnocentric(?) to blithely believe that saba, latundan, lakatan, seniorita, etc. MUST be the among best varieties globally, period. Or is it? For me, the saba is my all-time favorite banana variety, particularly when fried, or stewed or even boiled. And while I admit I have probably only tasted some 15-20 varieties of bananas in my entire life, saba bananas for cooking and lakatan for eating are my personal favorites… So when I spotted these rather unusual looking bananas at the grocery lately, I purchased them out of curiosity, hoping to find something new and intriguing. 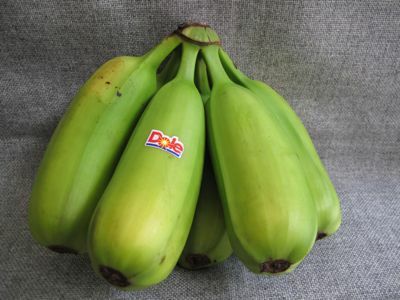 Labelled “Paradise” bananas, and marketed by Dole, they are a type of plantain banana, more suited to being cooked than being enjoyed raw. Turns out these are indeed a variety of plantain. And they were grown at the request of export clients in this part of the world. We seem to have gotten some of the first crop in our local groceries. Dole suggests pan-frying, boliing or baking the bananas. A day or so after I purchased them, I opened up two pieces and sliced them two ways and dropped them into hot fat, wanting to see how they would compare to our own sabas. They were starchier and less sweet than I expected, and had a rather spongy texture. Even sprinkled with sugar, these were not a good substitute for my favorite frying banana. HOWEVER, I think since these were starchier than most local varieties, they probably do well when cooked into dishes, or served as the starchy side dish, presumably in lieu of rice or potatoes. A couple of days later, with the bananas getting rather ripe, I mashed the remaining bananas, mixed in some egg yolk, flour and sugar and fried these up (photo above). Not a good idea. These were really mushy and soft and perhaps I had just waited too long before using them. So the verdict? I haven’t found the right use for them yet. And while I am thrilled that local growers are really starting to broaden their offerings… they need to come up with a really good recipe or two or three to give out to new consumers with products such as these so that there is a better chance that folks will try them and like them… The one recipe that was suggested for this variety involved first pan frying pieces, then mashing them, then frying the mash again and serving it as a starchy sweet side dish or snack. If anyone is familiar with this variety or has any good suggested uses, leave a comment. Thanks. Btw, one of my friends whose family has lakatan plantation says bananas with higher sugar content have more brown speckles on the skin. So I guess the uglier they look, the better they taste. And the prettier they are, more blah in taste. Hey, Ted, …that is a good use for the Aristocrat style Pnoy BBq chicken! The unripe plantain is quite bland so the filling which is Pinoy Aristocrat style BBq chicken will be a hit! I shall make it for the boys’ BBQ party on Labour day!!! could it be used for banana bread, the totally ripe variety of this? nice looking but not delish to eat..i bought some banana here yesterday at asian store. planning to make some turon out of it.. yumm! MM: I could be wrong but they look somewhat close to the ones I saw at the Vietnamese store. The lady said that is the common banana in Vietnam. I shall ask my Vietnamese friend what they do with those! hey i think that’s the same bananas being sold as cooking bananas in wellington. i have yet to try them though. i have tried green bananas to make banana-cue but they turn to mush when i fry them. damn. i wish i had access to filipino sabas!!! Vietnamese makes them into some sort of a bread pudding (with the ripe ones) made with coconut milk, eggs, condensed milk, bread cubes, etc. and calls them banh chuoi? or something like that. I am going to try it…she didn’t give me exact propotions…just said…a little bit of this and a littlle bit of that. betty q: are u still on a holiday? Hi MM. the “paradise bananas” pictured above are called Hawaiian bananas here in Maryland, also a relatively new produce that I have been seeing more and more in grocery stores. I tried them the usual way I cook my plantains but they are not as good, yes, more starchy than the other varieties but get a little sweeter as they ripen. Good plantains here are hard to come by anyway because of storage and somehow, the maturity at harvest varies. I notice that most other countries prepare cooking bananas or plantain before they are fully ripe, as tostones or simply fried. Interesting. I’ve never seen this particular type of banana before. I agree w/ what Ging said above–“the uglier, the better” kasi the ones we can find in the groceries here look so good on the outside but matabang when you bite on it. And yet, when you buy the Manzano bananas (latundan? ), as long as you wait for it to ripen and the skin is somewhat spotted na, then it’s perfect. betty q, i LOVE tostones!! but i do miss saba!! 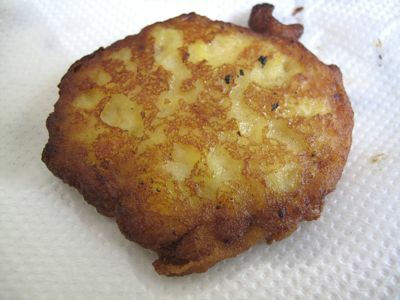 love nilupak (linupak, in ilonggo)..
bettyq, i do make tostones when i cook some puerto rican dishes. they’re good accompaniment for these kind of dishes. Ging, my own anecdotal experiences confirm what your friend said about “ugly” lakatan — the specklier (is that a word? ), the sweeter. When I get a good piling, the kids demolish in two days. Love tostones and so happy to have a regular supply of plantains at S&R. picked up these bananas too- but was not quite sure what to do with them. A few months back there was a recipe in Food & Wine for stuffed Tostones with goat cheese- it may have had some kind of mashed squash or sweet potato too… might be a good time to dig out that recipe! betty q, how is tostones different from mofongo? Tostones is twice fried banana slices while mofongo is fried pieces of plantains then smashed in a wooden mortar much like nilupak but seasoned with salt, garlic and pepper and pork cracklings or bacon are ponded with it. Tostones just looks like disks when it’s done. I like them when the bananas has already a hint of sweetnes in them. Some takeout chinese restos in NY has the tostones as part of side dish menu as well as french fries. I wax poetic about an older banana variety that has peachy/light oprange flesh. It was called lakatan then, but the lakatan now is white yellow. This used to be the banana in banana splits in the Magnolia plant in Aurora. Recently, through MM’s blog, I identified morados being sold at the foot of a hanging bridge in Bohol. Good too! Tasted like latundan. One of the many delicious Thai desserts sold on Sunday market is the Thai fried bananas. I tried the recipe once and we decided to wait for Sundays and just buy â€“ more economical to buy than to cook. My justification on a failed experiment. The ingredients consisted of plain flour, bicarbonate of soda, salt, sugar, 1 egg, water, shredded coconut or sesame and ripe bananas. I followed every step â€“ the batter did not look like hers â€¦. but well, maybe the problem was the oil and not me ha!ha!ha! there is a banana variety i tried in san pablo, laguna which was really good! it was a cross between a latondan and saba. i forget it’s name, but it’s something i don’t come across often in markets. It looks like “tostones” of the CaribeÃ±os when cooked, they fry them babies then mash it then fry it again but it looks different before cooked. What about ginanggang, MM? Maybe grilling them that way will bring out some flavor. We’ve tried this banana, too, and were also not impressed. If the bananas you featured here are indeed plantains then I would say they are the midget version of plaintains. 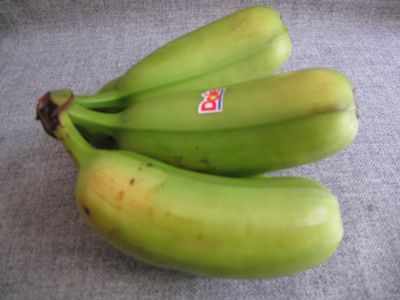 Plaintain bananas are gigantic. 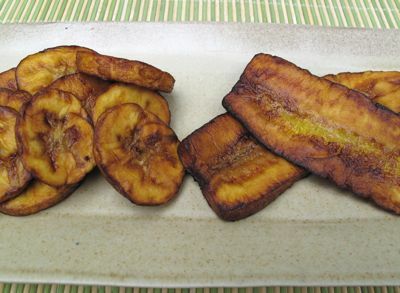 Plaintains are widely used in Cuban, Brazilian and like BettyQ said Carribean cuisines. They cook them when they are still on the eve of reaching their ripening stage. They served them as a side dish with their rice and beans to make a trio that goes well with either pork, beef, chicken or fish/shrimp dish. No big ceremonial prepped involved. The bananas are peeled, cut in bias and fried and I believe they add a small amount of sugar for the caramelized finish. You grab it right by the horn, the saba bananas are excellent. They are now available frozen in my Asian grocers. They make excellent bukayo with a big splash of Vermouth and muscovado sugar. Whatever laboratory engineered bananas they come up with our advanced technology, saba is still my number one choice. like lojet said, i think you can use those bananas for nilupak then sprinkle a little muscovado sugar to sweeten them up. nice find MM. I think I tasted those bananas. We bought a “buwig” along the Tagaytay Road to Nasugbu. They called it GLORIAS. Can anyone verify? When making nilupak,the bananas should be green, add shredded “alanganin” coconut and sugar (I use white) whirl it in a processor, your done! How about making the green ones into banana chips? banana give a vitamines to have clear vision of our eyes. like to buy some banana trees to plant, the banana tree that grows the big fat banana . like to buy four from you please tell me how much are they, thank you. I have to agree with Connie C. But I think it is more of Popoulu because Hua Moa is much bigger. By the way, where did you buy that banana? Johnny, these particular bananas were from S&R, but I have seen them at other large groceries. It seems they were specifically grown for export to New Zealand. John, I don’t sell anything. he, he, he… actually, I thought you bought it from Manila. But honestly I am a bit lost, I do not know where is S&R. What S&R stands for and where is it? As a vegetable, we also fry them green. We cut like either as potato chips (british) or as potato chips (american) and fry the chips. They are crispy and delicious. Tostones are also called Patacones in some countries. As a fruit, the ripe ones are baked with cinnamon and then hot milk or cream or sour cream is pour on top, it is a nice dessert. Plantain tornovers made with mashed baked ripe plantains are stuffed with mashed red or blank beans as well. What is kamote, sweet potato? In response to Karl Forsite’s question, yes, kamote is the tagalog word for sweet potato. It seems that the location of the commentator is automatically logged in this website. Yes I am an OFW in saudi Arabia. Cho, they aren’t that common. But I just saw some at S&R Cebu. I guess anyone that carries Dole products might have them. So try the largest groceries in Makati, Mandaluyong and the like, I suppose. What Poll Question Would You Ask?